The customers had liked a few designs on my website, but also wanted to develop a design particular to their ideas and aesthetic. There was much discussion of an appreciation for bridge designs by the Swiss bridge engineer and architect, Robert Maillart, where structural engineering and design expression were one. 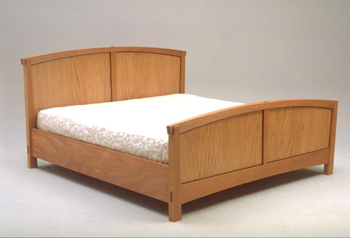 The design process for this bed frame is featured in an article by Brooke Baldwin for Modern Woodworking Magazine.